Thank you Chevy Stevens for another fantastic story. I've loved every Chevy Stevens book to date and Never Let You Go didn't disappoint. From the first page I was hooked. 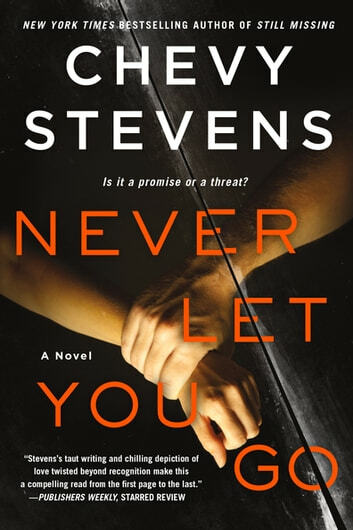 It was a tense read and as usual to Chevy Steven’s style there is a great twist to the story. This was a very solid mystery thriller. I was hooked by this book from the first page and I had a really hard time putting it down. I do have to say that the beginning of the story was a bit better in my opinion. I liked the last half of the story as well but it just wasn't quite as enjoyable. I picked up this book because I was looking for a change of pace and it definitely filled that need. This book really turned out to be quite the page turner. The book opens in the past and it does jump around in time for the first bit of the story. Lindsey is the focus of this book and as the story beginnings we learn piece by piece what her marriage to Andrew is like. There were some scenes that were truly frightening. Eventually Lindsey is able to get away from her abusive husband with her daughter. Her husband gets in wreck that same night that ends up sending him to jail for the next ten years. Lindsey and her daughter, Sophie, have been moving on with their life. Lindsey owns her own housekeeping business and Sophie is almost done with high school. They have connections and are doing okay. Sophie doesn't remember everything that happened between her parents and was shielded from most of it by her mother when it was happening. She is curious about her father and reaches out to him while he was in prison. Unfortunately, this means that he knows where they are. This book took a few twists and turns and there were some things that happened that completely caught me off guard. I thought that Lindsey's fear of Andrew was demonstrated remarkably well. There were several characters that I didn't quite trust completely. There were also more than a few moments that I really wished Sophie would just listen to her mother. While I wasn't completely sold by the ending, I did really appreciate the fact that this book ended up in a direction that I would have never guessed. I would recommend this book to fans of mystery thrillers. This is only the second book by Chevy Stevens that I have read but I do enjoy her writing style. I plan to read more of her work very soon. I received an advance reader edition of this book from St. Martin's Press via NetGalley. This was a really compelling story line as it went on and sometimes toward the last half I found it hard to put down. It was good escapist reading! Fantastic I love all of her books.Makes a really great day when there is a new one. I also live on Vancouver Island.